This article is about the South African airline. For other uses, see Airlink (disambiguation). 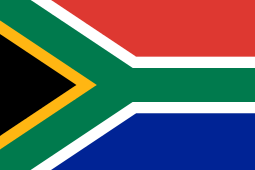 SA Airlink (Pty) Ltd. is an airline based in Johannesburg, South Africa. It is privately owned and has developed into South Africa's first feeder network aimed at linking the smaller towns, regional centers and hubs throughout South Africa. It has code-sharing and schedule co-ordination agreements with South African Airways and South African Express. Airlink was formed in 1978 and incorporated a range of other airlines: Midlands Aviation (founded in 1967), Lowveld Aviation Services, Magnum Airways, Border Air, Citi Air and Link Airways. It has a 40% share in Swaziland Airlink. In 1997 Airlink joined South African Airways and South African Express Airways in a strategic alliance which is governed by a franchise agreement. On 23 December 2009 the SA Civil Aviation Authority grounded their fleet of 13 BAe Jetstream 41 planes. Following audits of the airline's procedures and inspection of the grounded aircraft they were returned to service. A problem with a seal in the aircraft's Honeywell engines was found to be the cause of the safety issues. Airlink British Aerospace Jetstream 41 in the airline's old livery. On 24 September 2009, Airlink Flight 8911, a BAe Jetstream 41, crashed in the suburb of Merebank shortly after takeoff from Durban International Airport, injuring its crew of three and one person on the ground. The captain, Allister Freeman, died as a result of complications from his injuries on 7 October 2009. On 7 December 2009, an Airlink Embraer ERJ 135 (registration:ZS-SJW) on scheduled flight SA 8625, overshot the runway when trying to land in wet weather at George Airport; no fatalities were reported. The flight from Cape Town to George was cleared for an instrument landing (ILS) approach and prevailing weather conditions at the time were overcast, with light rain. The aircraft touched down in the area of the fourth landing marker. The landing appeared normal, however the aircraft did not vacate the runway but instead veered to the right and collided with approach lights before it burst through the airport's perimeter fence, coming to rest in a nose-down attitude on a public road. The aircraft was damaged beyond economical repair. Probable cause: The crew were unable to decelerate the aircraft to a safe stop due to ineffective braking of the aircraft on a wet runway surface, resulting in an overrun. Contributory factors: The aircraft crossed the runway threshold at 50 ft AGL at 143 KIAS, which was 15 kt above the calculated VREF speed. Although the aircraft initially touched down within the touchdown zone the transition back into air mode of 1.5 seconds followed by a 3-second delay in applying the brakes after the aircraft remained in permanent ground mode should be considered as a significant contributory factor to this accident as it was imperative to decelerate the aircraft as soon as possible. The transition from ground mode to air mode and back to air mode was caused by the crew doing a positive landing on a wet runway. Two months before the accident the runway was resurfaced with a fog spray sealant. The George area was experiencing a drought at the time and on the day of the accident it was the first rain they had received since the resurfacing. The fog sprayed surface caused a degradation of the surface friction and promoted the formation of pooling on the surface. After touch down the aircraft started aquaplaning. The crew veered to the right to prevent a collision with the localiser antenna. The runway was found non-compliant with ICAO annex 14 and was subsequently resurfaced. Airlink's insurers took legal action against the state-owned Airports Company of South Africa. Airlink's head office is in the 3rd office block of the Greenstone Office Park in the Greenstone Hill suburb of Ekurhuleni in Gauteng, South Africa. ↑ "CONTRACTIONS FAAO JO 7340.2". Retrieved 2 October 2014. 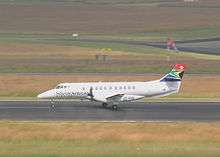 ↑ "S. Africa Grounds 14 Airlink Planes on Safety Fears (Update1)". Bloomberg. 24 December 2009. 1 2 "Airlink to commence Cape Town - Windhoek flights 6 October 2014". Retrieved 2 October 2014. ↑ "DefenceWeb.co.za - Airlink Jetstream fleet all fit to fly". Retrieved 2 October 2014. ↑ "MEDIA RELEASE: ACCIDENT - AIRLINK FLIGHT Update #2 at 16h30" (Press release). Airlink. 24 September 2009. Archived from the original (DOCX) on 19 July 2011. Retrieved 24 September 2009. ↑ "Crash plane declared emergency". Independent Online. 24 September 2009. Retrieved 24 September 2009. ↑ "Plane crash-lands in George". News24. Archived from the original on 13 December 2009. Retrieved 2009-12-07. ↑ Hradecky, Simon (2009-12-07). "Accident: SA Airlink E135 at George on Dec 7th 2009, overran runway". The Aviation Herald. Retrieved 7 December 2009. ↑ "Airlink plane overshoots George runway". Mail & Guardian. 2009-12-07. Retrieved 7 December 2009. ↑ "Crash of an Embraer 135 in George | B3A Aircraft Accidents Archives". Baaa-acro.com. 2009-12-07. Retrieved 2016-03-01. ↑ "Business Day - Airlink in clear, ACSA blamed for George near-disaster". Business Day Live. Retrieved 2 October 2014. ↑ "Company Announcement: Barrow's Latest Greenstone Hill Office Building Leased" (Press release). Engineeringnews.co.za. 2009-08-13. Retrieved 2016-03-01. Wikimedia Commons has media related to South African Airlink.